When it comes to professional uniforms, you want to make sure to have the comfiest, most practical outfit to help you do your job efficiently. This is especially true for nurses. The best scrubs for nurses should be of a comfortable material, fit well, and have pockets to store items. We should take great consideration into the scrubs we decide on, then after that, they need to work for us. The best scrubs are not far off or hard to find. In fact, they’re right here in this list! Say goodbye to your scratchy, uncomfortable scrubs. Say hello to the best nursing clothes around! I love these scrub pants from WonderWink. They fit a woman’s frame nicely with a bootcut leg. Nurses appreciate the full elastic waistband complete with a full webbed drawstring. The material is made lightweight yet flexible pant. Reinforced seaming adds to the durability of these pants. Not only are they durable, but they are also practical. You get six pockets, two of which have an added hook and loop layer. A bungee loop has also been added to the back pocket. Choose from a wide color variety and feel relieved that these are machine washable. Some may find that they fit tighter in the seat and rear, so curvier figures may want to order a size up. The Wonderwink scrub top is of top quality made with cotton, polyester, and spandex. This light material allows for just enough stretch, and the fit is extremely flattering on a woman’s figure. 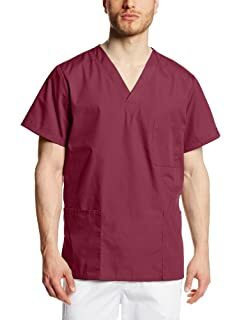 What really makes this scrub top stand out is the curve shaped neckline with facing overlaps at the center. It is a flattering cut that enhances the feminine silhouette better than other nursing wear. You get two lower front pockets and a signature triple pocket. This adds to the functionality of the scrubs. Side vents keep the top cool. The top is made long enough that it won’t show your belly when arms are raised. Women love these most comfortable scrubs from Wonderwink. Men love the Cherokee Workwear Scrubs because they are made similar to regular pants, just more functional. You get elastic all the way around the waistline plus a drawstring to tighten, zip fly, and many pockets. Just how many pockets, you ask? Four cargo pockets on the sides, two slash pockets and a back-patch pocket with button. The inner right pocket has 2 bands for holding penlights and bandage shears and an even smaller inside pocket for things like clipped pens. Talk about practical! They’re made of polyester and cotton poplin with soil release, which makes for easy washing. This material is not too heavy, nor too light. Pick from a variety of color options, and feel confident in your purchase. Now that you have the best scrub pants, you need the best nursing top to match. This top from Cherokee easily matches the practicality of the bottoms with three pockets and splits on the side for added comfort. It is made of polyester and cotton. Cherokee made this a thicker and heavier material, so it’ll be able to stand up to anything you go through in the ER/nursing office. This may also mean stiffer material, but after a few washes, it should soften up a bit. They’re made long enough so you can reach overhead comfortably without showing excess skin. This is high-quality nursing apparel that you won’t regret buying. 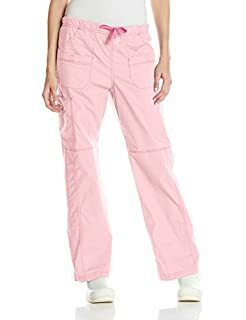 A favorite among women nurses are these scrubs from Dickies. The X-treme Stretch top is made with a fabric material that is soft, flexible, and breathable. Many even claim that the top feels like pajamas. The top is made with a V-neckline and princess seaming. This means a flattering fit on any woman. You get an intuitive front pocket at the waist and a flared bottom, which adds to a woman’s frame. This high-quality top is machine washable and doesn’t wrinkle after doing so. You can expect this top to last you a long time. Pick from a wide variety of color options for your discount uniform. 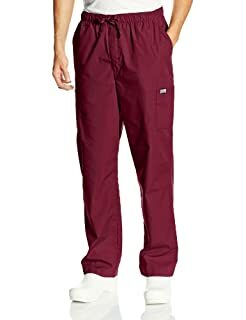 A popular scrubs brand, Dickies has some of the best scrub pants you could come by. 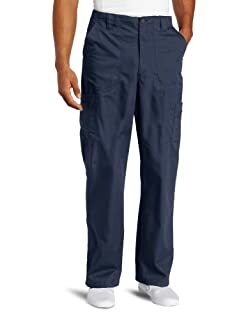 They are made extremely practical with nine pockets, an elastic waist with inner drawstring, and wide belt loops, a feature we’ve yet to see in any of the scrub pants reviewed. The nine pockets consist of two cargo pockets, two front and back pockets, and an extra exterior. The fabric is made soft and comfortable with cotton, polyester, and spandex. I love the fit of these pants. They are low-rise, loose-fitting, with a straight leg seam all the way down the leg. Junior fit means closer to your regular sized clothing than regular scrubs, which usually run large. Carhartt made an excellent option for men with their multi-cargo scrub pant. Made with cotton and polyester, these pants don’t stain and will last you for years to come. The fabric is lightweight but doesn’t skimp out on quality. You get a full functioning zipper fly and plenty of pockets (8 total) to hold everything you need. Front hand pockets are a little small and perhaps not as accessible, but this is a minor detail when you have 6 extra pockets. Drawstring and half-elastic back keep the pants up and secure around your waist. Men will enjoy the dark color selection available. With a heavier-duty material, this scrub top from Carhartt can withstand anything you put it through. It avoids fading in the wash and is also stain resistant like the previous pant bottoms described. The shirt is made with reinforced threads, which adds to the durability of the material. There are two pleats at the back yoke of the top and a chest pocket on the front. An angled pen slot has been added for practicality. Men like this top because it feels like it was made for masculine body types. The thicker fabric, unfortunately, does not breathe well. Those in cooler environments would find this beneficial. Many will recognize the show name Grey’s Anatomy, but who knew they made their own scrubs as well! 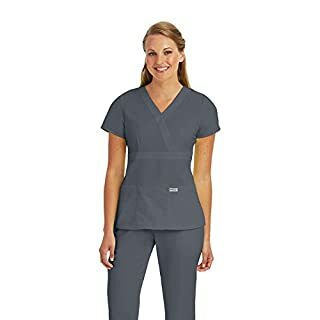 Their junior fit scrub top is made flattering with a mock-wrap V-neck line and practical with three pockets. The fit of this top is what sells it best. It is more fitted around the ribcage making for a more polished look. Buttons at the back are available for you to adjust how far it is brought in. The material is soft, made of polyester and rayon. The color does not fade off this top. Women nurses with more boyish frames say that this top is not that flattering for them. If this is you, you may prefer a more straight-cut fit. 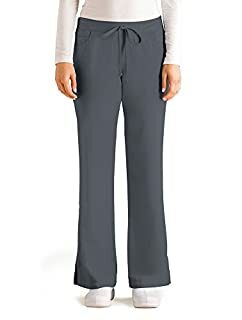 Grey’s Anatomy made a five-pocket drawstring pant to match with their top. These are made like dress slacks, so if you like to feel dressy at work, you’ll enjoy this option. Five pockets mean plenty of room to keep your most-needed items. These pants are lightweight, made with soft and comfortable fabric. These are not as heavy-duty as some nurses may like, though. These pants drape well. The back is elasticized and a drawstring allows you to secure them around your waist. You get plenty of color variety. Be warned that the lighter colors have been known to be see-through. Choose wisely! Finding your scrubs doesn’t have to be a hassle. You have plenty of other things to spend your time on besides what you’re wearing while at work. By making the best choice of scrubs now, you make your job ten times easier and never have to worry about an uncomfortable uniform again. Don’t forget about your compression socks and nurse shoes, which’ll keep your body healthy even while spending all day on your feet. Here’s my way of thanking you, nurses, for all you do. May your medical apparel never phase you again!